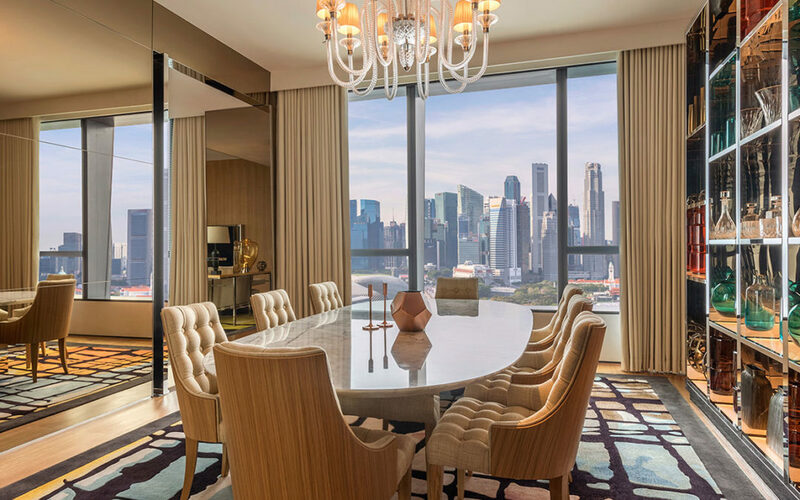 As one of its kind, the Chairman Suite is a luxurious penthouse with exclusive views of Singapore’s City Skyline and its landmarks. Providing you with round-the-clock Butler Service, with two bedrooms, a walk-in wardrobe, a spacious living room, a dining room, a study space and a personal pantry, the Chairman Suite is not only a home away from home but a home to dream of. Along with exclusive access to our Sky Gardens, Pools and a State-of-the-Art Fitness Centre, our Suite Guests are entitled to the Executive Lounge where breakfast, afternoon tea and evening drinks are served. Additional services in the Executive Lounge include a Business Centre with work stations and meeting rooms.